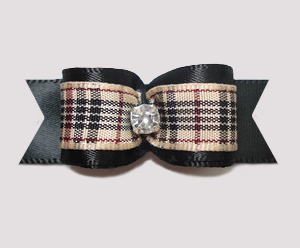 This classic bow features a beautiful Designer Plaid tartan ribbon imported from Europe. 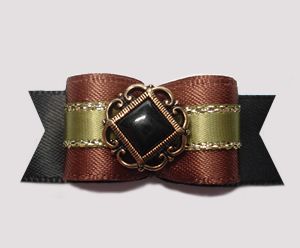 This great bow has an added inner lining of satin ribbon for additional durability. 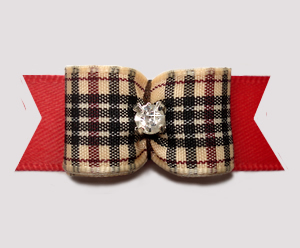 A classic red satin flag back ribbon complements the tartan ribbon perfectly. 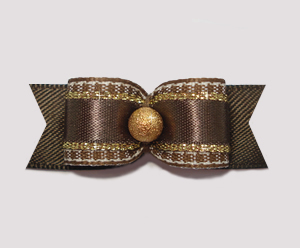 The center of this upscale bow is adorned with a gorgeous sparkling rhinestone. Beautiful! 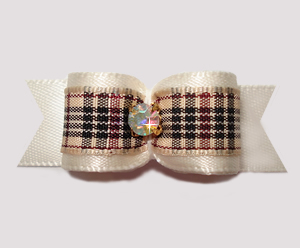 Note: Authentic Burberry tartan is not produced in ribbon - at least not ribbon that is available for sale. My research shows that Burberry tartan ribbon has been produced, but only for gift packaging and product presentation uses by Burberry themselves. 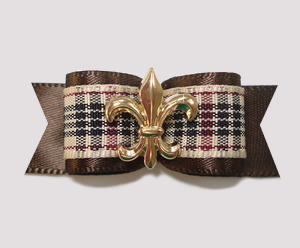 The very name "Burberry" is jealously guarded, therefore I am very clear in stating that I am not claiming to sell Burberry Dog Bows. I have, however, imported this ribbon from Europe and it is as close to the real thing as one can possibly get - plus it is gorgeous!